Gov. Jay Inslee, inaugurating a new Clean Energy Institute at the University of Washington on Thursday, reaffirmed his calls for a price on carbon dioxide emissions in the state. Having secured $6 million from the state Legislature for the inter-disciplinary institute, a feat Inslee describes as “a dream come true for me,” he is turning his attention to pricing carbon pollution, which could help finance emerging technologies that might someday be spun out of the Clean Energy Institute (CEI) compete against fossil fuel energy sources. Asked to evaluate the chance of passing a cap-and-trade system or carbon tax in the 2014 Legislative session, Inslee said he’s working on it, noting that a climate change task force—created as part of his first legislative success in this year’s session—was meeting Friday for a hearing on the subject. 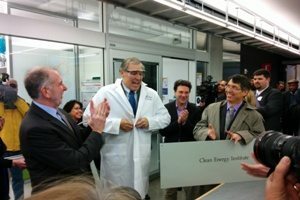 Inslee visited the Molecular Engineering & Sciences building, where the CEI will be based at UW. He donned a white lab coat and safety glasses for the cameras. Long a clean energy advocate, Inslee was clearly reveling in this small victory on a signature issue, and touted the economic benefits of clean energy leadership at every turn. But he also alluded to the work that remains to convince still-skeptical lawmakers and business groups. In the meantime, the CEI will focus on developing new solar and energy storage technologies, bringing together researchers across the campus, and looking for partnerships beyond. The two-year funding appropriation supports the hiring of new faculty in materials science and energy systems; equipping the building, which opened last year; and supporting upwards of 26 graduate students. CEI director Daniel Schwartz says the institute will be a place for research like the work of nanomaterials expert Hugh Hillhouse, whose group is making solar cells from abundant materials such as zinc, copper, tin, and sulfur. The CEI will unite the scientists working on new technologies with engineers who can help evaluate their potential place in the energy system and the broader implications if they do take off, he says. UW President Michael Young has made commercialization of research a hallmark of his administration, and clearly has the same aspirations for the CEI. “It’s very nice to have this in the laboratory, but getting it out of the laboratory and starting those companies—just as we have started over the past two decades 250 companies, 17 this year alone—is critical,” Young says. Asked if there are specific targets for commercialization out of the CEI, Schwartz says no, but he says he has a passion for it. Five of the 23 PhD students he has graduated have started companies locally, he adds. EnerG2, the Seattle maker of activated carbon used in advanced energy storage applications, is the best recent example of an energy company to spin out of the UW, and makes a fine model for what the CEI would like to achieve in the future. CEO Rick Luebbe says technology adoption by generally conservative utilities depends on cost, performance, and risk tolerance. When places like China, Germany, Japan, British Columbia, and California are leading on policies to regulate carbon emissions and incentivize renewable energy manufacturing and deployment, can the Washington cleantech sector thrive without at least equivalent state policies? Malarkey worries about the state’s track record in making strategic investments, noting the experience with the Life Sciences Discovery Fund set up by former Gov. Christine Gregoire in 2005 to invest tobacco settlement money in growing that sector of the state’s economy. It was supposed to have $35 million a year for 10 years, but funding was “carved away” with the Great Recession. “I think it’s going to take real leadership and it’s going to be incumbent on the governor to provide it,” Malarkey said, adding that leaders in clean tech and environmental groups have to help convince citizens of the state that it’s worth it. She said she’s optimistic because of the changing profile of the Washington electorate. Younger voters have “a completely different view about the future” as it relates to climate change, she says. Oysters like cold water so our oyster industry would move to Canada with global warming. I think that’s what he’s getting at.